In addition to the four members of the Panama Unit conspiracy whose sentences were reduced Tuesday by U.S. District Judge Randy Crane, seven others have also received reductions as of Wednesday morning. Alvaro Gilberto De Hoyos received a reduced prison sentence from 90 months to 80; Salvador Joel Arguello, from 140 months to 115; Claudio Alberto Mata, from 140 months to 113; Eric Michael Alcantar, from 120 months to 96; James Phil Flores, from 120 months to 97; Jorge Garza, from 121 months to 97; and Fernando Guerra Sr., from 180 to 147. Guerra’s son, Fernando Guerra Jr, who purchased stolen drugs from members of the Panama Unit, was the only conspirator who did not receive a sentence reduction Tuesday. He was released from prison in 2017. A federal court on Tuesday reduced the prison sentence of the son of former Hidalgo County Sheriff Lupe Treviño and other members of the corrupt Panama Unit, court notes show. The reduction of a little more than three years, or 38 months, of prison time for Jonathan Christian Treviño was ordered due to a guideline sentencing range that was lowered and made “retroactive by the United States Sentencing Commission,” records show. In all, the court dismissed 13 of the 14 counts Jonathan Treviño was charged with and convicted of on April 30, 2014, including five counts of conspiracy to distribute a controlled substance, four counts of selling, distributing and dispensing a controlled substance, and two counts each of conspiracy to distribute narcotics, and public money, property or records, court records show. Jonathan Treviño, who nearly five years ago was sentenced to 17 years in prison for his role in a drug conspiracy case involving multiple corrupt law enforcement in South Texas, was expected to be released in May 2031 based on the 17-year sentence, and is now expected to be released sometime in March 2028. The soon-to-be 35-year-old former Mission police officer played a role in the Panama Unit corruption case, which involved members of a rogue drug task force comprised of Jonathan Treviño, another Mission police officer and sheriff’s deputies who worked together to steal loads of drugs and money from drug traffickers. Federal agents, who began investigating the group sometime in late 2011, made the case public in December 2012, when Panama Unit members were arrested. Lupe Treviño, who was sentenced to his own prison term a few months after his son in a separate federal drug case, was the sheriff for Hidalgo County for nearly a decade beginning in 2005. During sentencing, Jonathan Treviño told the court that his father did not know about what he and other Panama Unit members were involved in. 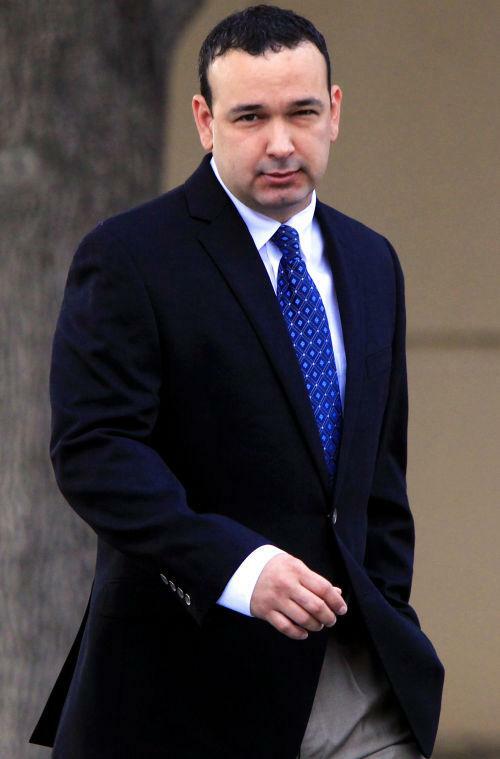 The elder Treviño pleaded guilty in July 2014 to federal money laundering charges in connection with a case that involved the then-sheriff taking campaign cash contributions from a suspected drug trafficker. The 69-year-old Treviño was released from federal prison earlier this year and is currently serving his four-year supervised release term. In all, prosecutors indicted nine lawmen and three drug traffickers during the course of the case. Also seeing a reduction in their sentences was Alexis Rigoberto Espinoza, a fellow Mission police officer and son of now-former Hidalgo police chief Rudy Espinoza, from a 168-month prison sentence down to a 134-month prison sentence; Fabian Rodriguez, a former sheriff’s deputy, from 156 months to 126 months; and Gerardo Mendoza-Duran, also a sheriff’s deputy, from 96 months to 80 months, court records show. Jonathan Treviño has served nearly 60 months of what is now a 166-month prison sentence, leaving him with approximately 106 months left to serve. Upon his release from prison, Treviño will be placed on four years supervised release, court records show.